Introducing the new line of FreeMotion Epic Series Selectorized Equipment. New designs feature a reduced tower height for easier maintenance, and to sophisticate the line's look, heavy-duty 11-guage tubing with a flat-oval design and consistent alignment and footprints for easier floor planning. Get fit fast with the FreeMotion Epic Series Plate Loaded Leg Press F218. The FreeMotion EPIC Plate Loaded Leg Press F218 targets the quadriceps, hamstrings, glutes and calves. This commercial grade exercise bench offers a starting resistance of 90 lbs and a maximum load weight of 900 lbs. The seat adjusts to two different positions to accommodate any user while the textured platform helps secure foot placement. A sophisticated weight locking lever ensures safe, easy and secure use. Each load bar is positioned to facilitate easy entry and exit from the machine for a hassle-free workout. And, predrilled holes allow this leg press to be bolted to the floor for added stability. A perfect blend of functionality, safety and durability, the FreeMotion EPIC Plate Loaded Leg Press F218 is ideal for any gym or fitness center. Call 1-800-875-9145 to speak with one of our fitness agents with any questions you may have. Go to FitnessZone.com and order your FreeMotion EPIC Plate Loaded Leg Press F218. Seatback adjusts in two positions to comfortably fit a variety of users. Equipment is built with 7 and 11-guage steel and is electrostatically powder-coated. To help ensure secure foot placement, the platform is coated with Linex®. Seat position is raised and platform is positioned for easy entry/exit of the machine. Each load bar holds up to 450 lbs. per side and is positioned to facilitate easy entry/exit of the machine. 10 Years Structural Frame, 3 Years Bearings, Guide Rods, Pulleys, Weight Stacks, 1 Year Cables, 1 Year Labor, 120 Days Upholstery & Handles/Accessories. 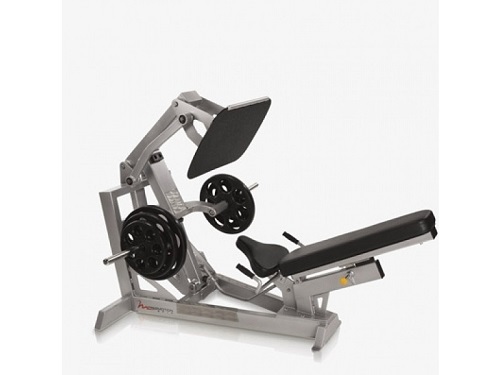 Order your FreeMotion EPIC Plate Loaded Leg Press F218 from FitnessZone.com today!